The factory-backed BMW Team SRM squad has taken delivery of its first BMW M4 GT4, ahead of a planned Liqui-Moly Bathurst 12 Hour and Australian GT Championship assault with the brand new car this season. BMW Team SRM has been working on securing one of the brand new GT4-spec racers since BMW first revealed plans to join the burgeoning entry-level GT category, and was part of the early allocation when production commenced in Munich. “The experience gained with the BMW Team SRM GT3 programme has encouraged us to further the relationship,” said BMW Group Australia CEO, Marc Werner. “The M4 GT4 enables us to take it to the next level. “As well as competing alongside the M6 GT3 in the 2018 Australian GT Championship, the M4 GT4’s ability to participate in the GT Trophy Series further expands the motorsport possibilities for our passionate BMW M customer base. 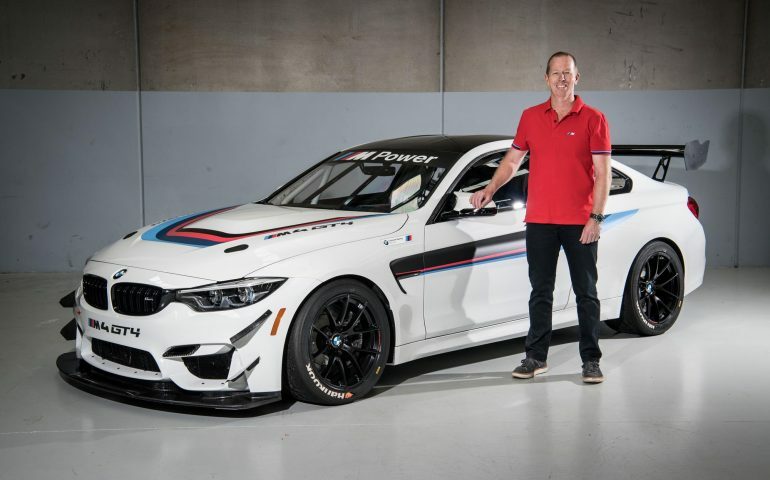 “Being so closely related to the M4 road car, the BMW M4 GT4 is an ideal step for those wanting to progress from track days to racing,” he said. The BMW Team SRM M4 GT4 has now arrived in Melbourne, with preparations for next February’s Bathurst 12 Hour ready to begin following a successful shakedown test at Winton. According to four-time Bathurst 1000 winner and BMW Team SRM boss Steve Richards, early signs are that the car has hit every expectation. “It’s been a 12-month build-up since BMW first had the prototype running, and it’s everything they said it would be,” said Richards. “It’s so easy to run. When we picked it up from the airport, I drove it onto the trailer. Everything about it is simple; it’s perfect for an amateur racer to put on the trailer, head to the track, have a drive, and then put it back in the shed. It’s a very user-friendly, low-overhead car. “It’s a proper racecar, too. It’s based on the fantastic road car platform but it’s not a production car – it’s built from the ground up as a racer. Richards tested the car as part of the Winton shakedown, and was left deeply impressed by how capable it is. “It’s great to drive,” he added. “Its corner speed is fantastic. There were some Supercars and some Carrera Cup cars running during the test, and through the corners the M4 GT4 was as fast, if not faster, than anything else. A second M4 GT4 has also recently arrived in the country and is now in the possession of new owner – and former BMW Motorsport racer – Tony Longhurst. As well as the BMW Team SRM and Longhurst entries, New Zealander Kent Baigent has also purchased a car to run on the Mountain next February 2-4.